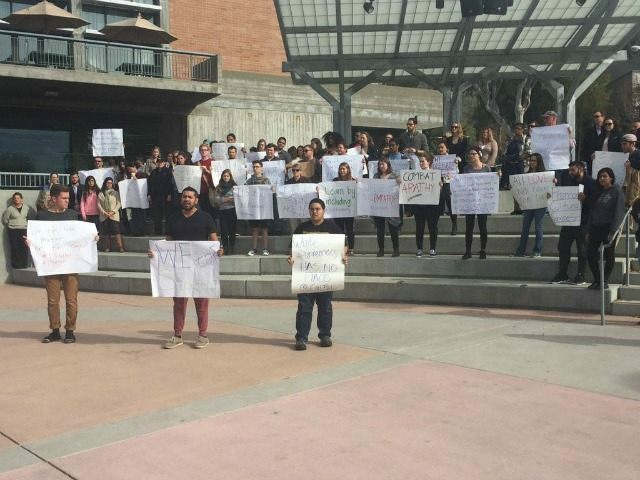 “Underrepresented” students from an unrecognized consortium of minority student groups at Cal Poly–known as SLO Solidarity–have joined the ranks of other student-led protests throughout the country and presented a list of 41 demands for diversity initiatives for administrators to implement. Similar efforts were recently made at Occidental College, where minority students led efforts to occupy the private university’s administration building for nearly a week as they presented a list of demands which called for the resignation of the school’s president, Jonathan Veitch, and for unarmed campus security officers to relinquish their bulletproof vests. Veitch said he was not going anywhere. On Thursday, Veitch–who has served in his current post since 2009–held an hour-long meeting with student protesters in another attempt to reason with them. He was again grilled by them, this time for allegedly spending too much time away from campus as they occupied the building he works in. According to the Los Angeles Times, Veitch disputed allegations that the school is not committed to diversity and said he was perhaps partly to blame for an air of hostility between students and the administration. Occidental’s student body is 42% minority or multiracial. The students again demanded Veitch’s resignation if their demands are not implemented. “This is the beginning of the conversation,” Veitch reportedly said. Follow Adelle Nazarian on Twitter @AdelleNaz and on Facebook.